Mix dressing ingredients together in a small bowl, chill one hour to allow flavors to mingle. Combine salad ingredients. Toss dressing with salad in a large bowl, or drizzle each serving plate of salad with dressing, as desired. Combine panko crumbs and chili powder in a shallow bowl. Dip avocado slices in buttermilk, sprinkle with salt, coat with panko crumb mixture on all sides. Place on a sheet pan and refrigerate 10 minutes. Heat oil in fryer to 375°. Deep fry avocados until golden. Drain, sprinkle with sea salt and serve while hot. Great on top of salad or along side the entree! A dash or two of Chipotle Tabasco on them is great! Place all ingredients for the marinade in the bowl of a food processor. Pulse initially to evenly chop, then process until smooth. Transfer half of the mixture to a non-reactive container or a zip top bag, reserve the remaining half for sauce. Place pork tenderloins in this container, toss to coat, and let marinate 4 hours or overnight. Remove from marinade, pat dry, and grill until cooked through, basting occasionally with marinade. Let rest 10 minutes before slicing. Heat the marinade reserved for sauce in a small saucepan, and drizzle over sliced pork when serving. Garnish with additional cilantro if desired. Mix the cornmeal, flour, salt, baking powder, cumin, cilantro, cheese, eggs, milk and butter. Stir to make a smooth batter. Stir in remaining ingredients. Lightly oil a non-stick skillet. Heat over medium heat. Drop batter in heaping tablespoons onto skillet. Grill until golden. Serve warm or at room temperature. These can also be cooked as waffles! Preheat oven to 325 °. Grease a 9 X 13-inch baking pan. In a large mixing bowl stir together the melted butter, cocoa powder, and sugar until well blended. Add eggs, one at a time, and beat well after each. Add in flour, cinnamon, salt, vanilla and Kahlua and stir until mixture is smooth. Stir in chocolate chips and pecans if using. Spoon into prepared pan, and smooth the top of the batter. Bake 35 to 40 minutes until the brownies are pulling away from the sides of the pan (they will not test “done” with a toothpick, as these are very moist brownies). Allow to cool in pan completely. 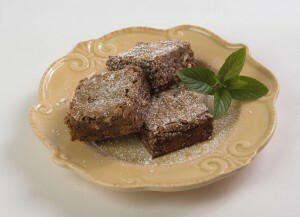 Cut into 24 brownies and dust with powdered sugar before serving. Store in an airtight container.